I can't tell you when I first read "Where the Wild Things Are," but I have probably read it hundreds of times to my kids. Those googly-eyed monsters go so quickly from funny to scary, just like real nightmares. It's wonderfully creepy when Mickey loses his pajamas "In The Night Kitchen." I adore the slightly seditious edge to Pierre, a little boy who gets (deservedly) eaten by a lion, and when the lion roars and Pierre falls out... Pierre "rubbed his eyes and scratched his head and laughed because he wasn't dead." That's downright profound. 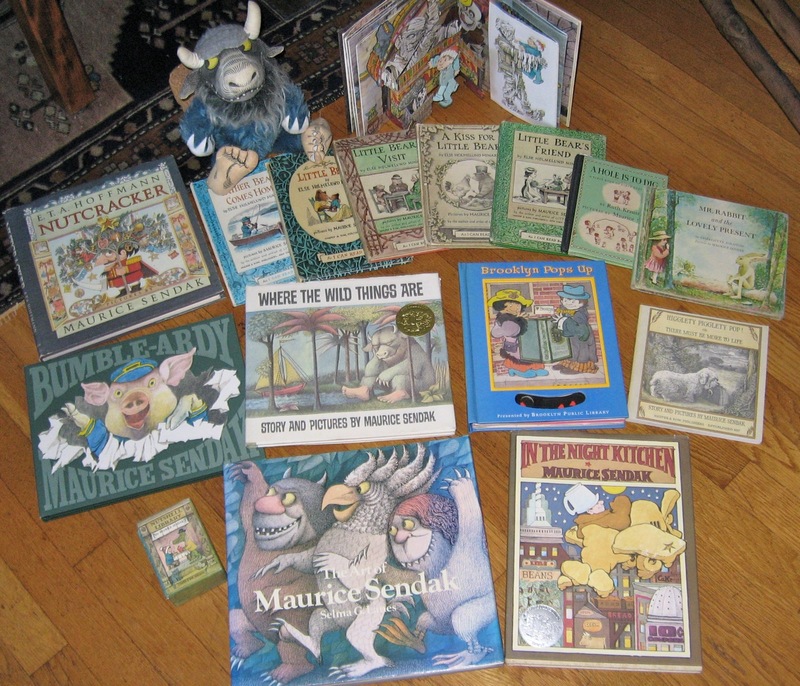 So, Reds, were Maurice Sendak's stories and illustrations part of your life, and what were your favorites? HANK PHILLIPPI RYAN: A Hole is To Dig. 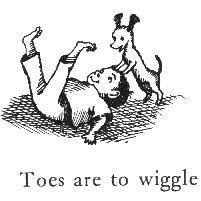 But Maurice Sendak didn't write it--he illustrated it. Wonderfully. (I hope that counts.) My favorite-favorite from as long as I can remember. And I have given it to new parents and kids for...years. Dozens of copies. It's just a tiny book of snippets by Ruth Krauss. Lines like "Mashed potatoes are to give everybody enough." One line goes across two pages of tiny kids saying "I'll sit on your cold feet and you sit on my cold feet and then I'll sit on your cold feet and then you'll sit on my cold feet..." "A face is to have on the front of your head." Also, "a face is so you can make faces." "A hand is to hold up when you want your turn." "A party is to say how-do-you-do and shake hands." Now. Confession. I do not like Where the Wild Things Are. And I do not like In the Night Kitchen. I just--thought they were unpleasant. I know I'm in the minority. JAN BROGAN: No, Hank, I completely agree. I do not know Maurice Sendak except for those two books and ....the art just creeped me out. I did not not respond well to his illustrations, but then, I'm not a big fan of nightmares. But Hallie, maybe this is why you write thrillers. Personally, I loved Roald Dahl, who I think is brilliant and witty. HALLIE: He wasn't what you'd call soft and squishy. Hated book events. But he really got children. ROSEMARY HARRIS: Bruce was one of his publishers and I can remember going to a fabulous party for The Nutcracker. Bruce traveled to Italy with Maurice and spent a lot of time with him, but I only met him once, at a dinner at Cafe des Artistes. I think it was my first dinner with a famous author! Before I'd met him - of course - I was convinced that I was Really Rosie and I was a great big deal. I have a few signed Rosie cels and I actually have a reference to Pierre(I don't care) in my WIP, written months ago. Lot of sadness in the Harris household when we heard. Not to be too grim but, I would also add that today is the 11th anniversary of the untimely death of Douglas Adams, another of Bruce's authors. Met him too and he was incredibly cool. (My husband is very cool and I get to go along on some fun rides...) Wave those towels! RHYS BOWEN: Two of my favorites--Sendak and Douglas Adams. Where the Wild Things Are is such a profound book. You could teach a child psychology book on it--on tantrums, on wanting to be loved and realizing that one is loved... where his supper was waiting... and it was still hot. Magic. And Douglas Adams. The ships hung in the sky the way bricks don't. Another of my favorite lines. HANK: Oh, LOVE Douglas Adams. The Babelfish. I still think about it. And DON'T PANIC! My motto. DEBORAH CROMBIE: Oh, Ro, so jealous. Loved them both, but Douglas Adams was one of my literary heroes, especially the Dirk Gently's. The Long Dark Tea Time of the Soul is one of my favorite titles ever. And Sendak! When I saw we were talking about him, I had to go dig out my copies. I loved Where the Wild Things Are, but In the Night Kitchen was my favorite, and I can't find my copy! Again, I would have loved that book just for the title, but I didn't find them creepy. I thought they were little lessons about conquering your fears. I'll have to ask my daughter what she thinks, and which were her faves. He did a lovely book called Outside Over There, about a little girl named Ida who rescues her baby sister from ice goblins. It has the most beautiful illustrations, including Ida's gorgeous German shepherd. These are more like paintings than cartoons, so do try to find this one if you've never seen it. 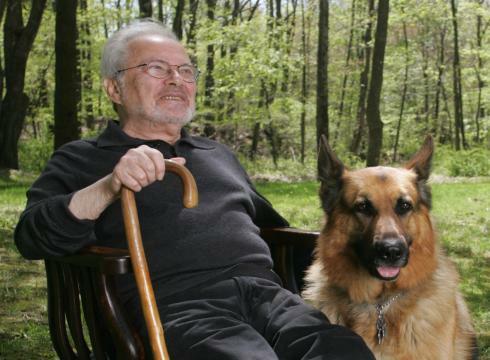 ROSEMARY: I think he had a couple of German Shepards. HALLIE: So what are your recollections of Sendak? Listening to Carole King singing Chicken Soup with Rice... Sigh. I first read Where the Wild Things Are to my nephews, the oldest of whom is now 40 with three children (sheesh, where did the time go?! ), and then of course to my own sons. I love that book. And somehow have never read any others by Sendak, which now seems very strange. My sister gave me a copy of A HOLE IS TO DIG, and I still howl at every reading. 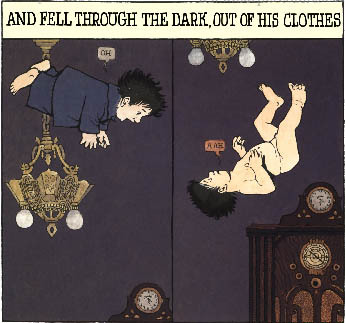 True, Maurice Sendak didn't write the narrative, but his illustrations are side-splitting. It is one of my treasured books. Hank, this must mean we are kindred spirits! 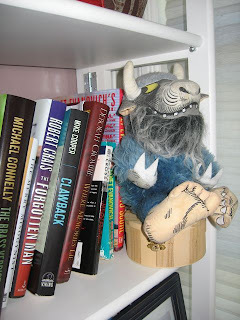 I read many of Mr. Sendak's books to my boys. They were all wonderful, and magical, and at times a little bit unpleasant. The books were, too. Oh, Edith, what a treat you have! Take thee to yon library and borrow In the Night Kitchen, Pierre, Bumbleardy, the Little Bear books, the list goes on. A Hole is to Dig is right up there with Pat the Bunny and Good Night Moon. 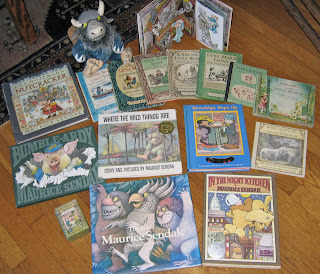 I'm a little ashamed to admit I've never read any of Maurice Sendak's books. I have, however, read most of Douglas Adams', and if you haven't read his non-fiction book Last Chance to See, about endangered animals, you must. Isn't it wonderful that one author can inform our culture with so much meaning to entire generations? Writing has such power. My girls were not great fans of Where the Wild Things Are. I suspect it was the illustrations as much as anything else. Around the same time that I bought that book I also bought the Sendak-illustrated Nutcracker, which I think is wonderful, but the girls also were not crazy about. However, it gets set out on the coffee table near the Christmas tree every year, along with A Visit From Saint Nicholas (aka The Night Before Christmas), which is read every Christmas Eve before the youngest child goes to bed. So far, no one has read from The Nutcracker; maybe we should do that this year. My grandson is now seven, and old enough to enjoy it. Kate Gallison, I read your comment. Then read it again. THEN burst out laughing. LITTLE BEAR! I do love it. I think. But again, sad. In my folk-singing lefty family we treasured a hardcover memoir by folksinger Jean Ritchie, called SINGING FAMILY OF THE CUMBERLANDS. It was published in 1955 by Oxford Univ Press NY. 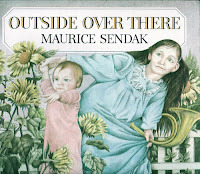 In addition to Jean's wonderful story of growing up in the Cumberland Gap, it contained illustrations by...Maurice Sendak. He must have been all of 26 when he did the lovely little pen-and-ink drawings, and probably wasn't very well known. I can still be reduced to tears by some of the stories and many of the illustrations. Sidebar: When I worked for radio station WBAI in the 1970s there was a book-reading program called "Continued Tomorrow." I loved SINGING FAMILY so much that I produced a weeks-long complete reading of the book--and always regretted that our listeners couldn't see the Sendak drawings. Sorry--I had to choose "Anonymous" for a handle, but I'm Lorrie Bodger, NYC, friend of Hallie Ephron and of course of JRW. Ro, I envy you! Meeting Maurice Sendak and Douglas Adams, two great originals! My favorite Sendak creation is Really Rosie with Carole King. But they were all wonderful. In The Creative Habit: Learn It and Use It for Life (GREAT book for writers! ), Twyla Tharp talks of Sendak's approach to generating creative work, as well as her own, since he was one of her greatest friends. The Giving Tree is sad? I'll have to go back and read it. We haven't talked about Shel Silvestein, another subversive voice in children's lit. We're big fans of Where the Wild Things Are in this house. Has anyone read Robert Munsch's Giant or Waiting for the Thursday Boat? It's my favorite Munsch book after I'll Love Your Forever. He portrays God as a little girl, which has gotten the book banned in lots of places. I love ALL of the Sendak books. Not creepy at all to me! (Or maybe they're just creepy in a way that I can appreciate!) I was a great Silverstein fan, too. I always enjoyed reading from both authors to the nieces and nephews. It is so sad that both authors are gone now. love, love, love the polar bear poem--it's better than any diet! I first read WHERE THE WILD THINGS ARE to little Scott Spooner when I was his babysitter too many years ago. He loved it. I had nightmares walking back down Chestnut Street on Beacon Hill and finally hailed a cab rather than walk through The Public Garden to home. I discovered Sendak when my children were little. Oddly, although I practically LIVED in the library as a child, I do not remember him there (or Roald Dahl, either, for that matter. Could it be my small Iowa town thought they were too subversive back then! ☺) What a joy to have read him to my kids. My son is Max and, at 14, I still watch out for the wild rumpuses. Little Bear was my daughter's favorite. In Kindergarten they each made pictures based on "Chicken Soup with Rice" ("Stirring once, stirring twice, stirring chicken soup with rice.") And no one gets to answer "I don't care" to a question in our house, as Pierre will always get trotted out.